This wasn’t our first outing to KANOA (I really like shouting inside my head every time I write the word). Every time Liz’s parents visit, they take us to KANOA. But I’m not complaining. I wish they would visit weekly. Maybe even twice a week. Apparently, KANOA is one of the only Venezuelan restaurants in the region (her family is from Northern Virginia) that is authentic and reasonably priced. So every time they’re in Richmond, Liz’s parents have to go. Again, not complaining. They have to invite me, too. This visit was most exciting, however, since it was a Saturday morning, thus this blog’s favorite meal of the week: BRUNCH. I eagerly went online and checked out the brunch menu. Brunch starts at 11:30 AM on Saturday (10 AM Sunday), and we arrived as the O lit up in the neon OPEN sign. Liz’s parents asked if Sara and I wanted to try _____, which is blank because I don’t know what they said. But we agreed because we wanted to live on the wild side. They ordered us tamarindo, which is tart, and guanabana, which is sweeter. The darker one is tamarindo. I didn’t find it that tart, but Sara did. I recommend ordering this if you want a juicy slush drink. KANOA also gives you bread while you order and accompanies it with an olive oil, cheese, and spice mixture whose recipe I should ask for. This is not a place for the carb conscious. Her parents also ordered tequeños for the table. Tequeños are fried cheese-stuffed bread pieces that are better than mozzarella sticks due to their crispy exterior. Aka you should order these too. They come with a cilantro cream sauce that's not as cilantro-y as you would think given the name. I don't like cilantro, but I did like the sauce. For food, I ordered off the brunch menu, but their regular menu is also available. I got the crab and shrimp omelet since the waiter said he preferred that to whatever other option I gave him. The omelet came with black beans, fresh fruit (mostly cantaloupe), an arepa (more on that), and sweet fried plantains. The omelet (and the plantains) reminded me of Kuba Kuba in that this is not a cheesy omelet that you make in your American kitchen. It’s more like an egg pancake with not even that much egg. Or cheese. I think I was missing the cheese. Overall, it tasted very crabby, which is what is promised by the name. My only concern is that I kept tasting something crunchy that got stuck in my teeth, and it turns out it was part of the crustacean’s shell. Not sure if that’s supposed to be in the omelet. Extra calcium? But the beans are great! I’m normally not a bean person. But these black beans – mm! I just got a plain arepa. Not as gripping. 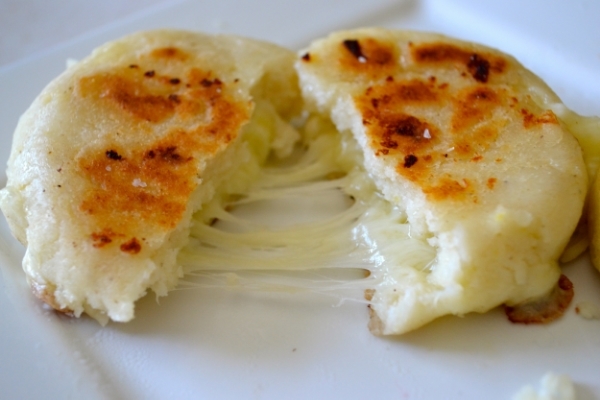 And then there are cachapas, which are my favorite I’ve decided ultimately. Liz’s mom ordered this, thankfully, and let us have some. A cachapa is a corn-based pancake, but it’s not at all like a pancake. You don’t put syrup on it. But you put cheese between it. Yes, cheese. It’s a quesadilla! Is there anything better? We ended the meal with tres leches cake, which, what can I not say about that? Next time I go to KANOA, even for brunch, I will be ordering an arepa and a cachapa. And then maybe some tamarindo to wash it all down.